Water Lilies by Monet – the Magic of Water and Light tells the story of the origin of a massive work of art that broke with convention, of an artist resurrecting his life only thanks to painting. His human endeavor defied both space and conventions in his timeless masterpieces. In a war-torn country, the undisputed genius of French Art disrupted the art world and changes it forever. As the end of the First World War drew near it became clear to Monet that his work of art could not but be his final legacyto France: a symbol of peace, hope, and resistance, in a battered and bloody world. This is the tale of an obsession with light and water the painter could not escape from and how he transformed it into a kind of magic. A tale of the radical elements that revolutionized Modern Art: Monet’s clear intentwas to transfer onto canvas the “first, pure impression” of forms and objects as they appear to the eye that has never seen them before. 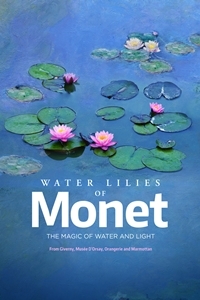 And this documentary will show the Water Lilies by Claude Monet, as they have never been seen before. A unique, exclusive look at the masterpieces housed at the Orangerie Museum, the Marmottan Museum, the Orsay Museum and Giverny, forthe firsttime ever on the big screen for an unrepeatable experience.